This article explores the specific experiences of an entrepreneur (who uses the pseudonym “Hard Drive,” a nickname he earned early in his career for his tenacity and decisiveness) and lessons learned bootstrapping a high-tech software as a service business in the social media space. His sustained efforts enabled him to raise $40,000 in angel funding, pull together a team of part-time contributors working for equity, establish three pilot customers and present to 11 venture capital firms. All of this was accomplished while the founder and CEO held regular, full-time employment at a Fortune 500 high tech firm. Whether you are bootstrapping or exploring while you keep your day job, effective time management is the key factor in successful business progress. Although Hard Drive ultimately shut down this startup, his experience honing his time-management expertise and design of new technologies in leading edge Internet and social media domains provided background for further employment and consulting opportunities. Oscar Wilde observed, “Man is least himself when he talks in his own person. Give him a mask, and he will tell you the truth.” We have had only a few anonymous posts on the blog in the last decade but I think in this case the insights offered justify allowing the author to “wear a mask.” His time management techniques are delightfully pragmatic for work that is not well-defined or lacks clarity and for whom the customer to be satisfied is somewhat ambiguous. I think this level of uncertainty characterizes most startups, at least in the initial stages, and I think Hard Drive offers some practical methods for producing real results in these very real situations. Create time through effectiveness, building trust and teaming. Separate role performances and resource uses between regular work and your startup. Engage creative thinking for innovation. Adapt the Unfolding Action List to fulfill your goals. Knowing how to create time for running your startup is most crucial when a person manages startup activities while holding a full-time job. I’ve taken care of my entrepreneurial concerns, progressing from the aspiration to lead a startup to fulfilling that ambition through enabling powerful practices to simultaneously perform multiple work-related efforts. Run and build your startup. This is a challenging endeavor and requires a clear business strategy and effective practice of time management to maintain employment in good standing while pursuing the possibilities of your own enterprise. Even if you don’t have a full time job to handle while running your startup you might be interested in my time management practices. I believe in self-improvement and have pursued education and training to enhance my work as an employee—and to be well-grounded for my startup activities. A clue to me that I might be skilled at getting things done and managing my time occurred after managers at various points in my working career sent me to classes on how to make better presentations at meetings and how be more sales-like, saying that the last thing I needed was time management skills. They stated that they were impressed that I got a lot done without supervision. So, while I continue to pursue more skills around presenting and speaking at a high level to groups and to executives, I’m pleased to share what I believe to be the skills, methods and techniques that enable productive use of time. Every person and situation is different. Therefore, what worked for me will likely need modification and adjustment to fit your skills, capabilities, capacity for work and circumstances. I’ve honed these time-management practices while handling dual roles of employee and entrepreneur—and while just being an employee before and after my entrepreneurial stint. I’ve always been a seeker for improving my time management capabilities since I was 13 years old, when I was old enough to become a paperboy and run my own business—technically an independent contractor for the publisher. In that structured business environment, with lots of independence and responsibility to achieve daily objectives with little supervision, I excelled, growing the customer base significantly and winning awards and prizes. I’ve been a student of business practices since the third grade, have read many of the management books Sean recommends, and have included eclectic practices, like studying the technical, methodical and philosophical practices of the ancient Egyptians whose practicality and time management produced a great civilization and magnificent wonders. In college I studied information technology, economics and business—garnering certifications and bachelors and masters degrees. The cornerstone of my entrepreneurial time management practice is for you to maintain your current employment, with the assumption that you need the income of your job to sustain your personal responsibilities, lifestyle and time to progress your startup. If you are not careful, you can put your job and employment reputation at risk. So, the first order of business is to keep your job. If you are going to start your own business while maintaining employment, to meet your goals you will need to separate the worker and bootstrapping efforts to avoid conflicts of interest, effectively allocate time and a ensure balanced work-recuperate lifestyle. By “balanced work-recuperate lifestyle” I mean that sustaining ongoing disciplined efforts for productivity need to be pursued in conjunction with refreshing activities, such recreation, relaxation, rest and attention to nutrition and exercise. Otherwise there will be exhaustion and breakdowns, physically and mentally. You want to work skillfully and with great effort; however, making sure that any tiredness is temporary with a bounce-back to normal energy levels after resting: if after a good night’s rest or a weekend away from your work efforts you are not re-energized, then you are pushing yourself too far. My philosophy is based on thinking that the mind and the body are inseparable, and that that they are two complementary aspects of a person being in action for multiple concerns. Further, “no man is an island”—we are all interdependent on each other, so any success you have is connected to family, friends and business associates. An over-sense of entitlement diminishes your ability to recognize and appreciate all the resources you have available. Rather, it’s more powerful to recognize and reflect on all the positive aspects of your life and circumstances, and establish a regular practice for expressing gratitude for what you have. I ran a C-corporation startup for about 10 years while simultaneously winning awards, bonuses and promotions at a Fortune 500 high-technology firm. I also kept my two job lives separate and without conflict, thereby providing compartmentalized time and resources to pursue my ambitious startup plans. First off, to be effective at work, which is your primary obligation, you need to have effective time management and effectiveness skills to ensure a high and reliable level of work performance. Once those are in place those same skills can be used for your startup. Second, you need to diligently manage the separation of your employment role and your startup role to avoid conflicts. You will be holding multiple concerns, taking actions for the care of each, while selectively presenting multiple facets of your of your persona as you interact with others. While you have a broad range of commitments, such as for personal health, family, finances and so forth the, two domains of concern that are challenging to simultaneously manage are what we are bringing to the foreground as the primary topic of this article: keeping your job and managing your startup. You also need to take care of all your other concerns, which are in the background, and for which the effective time management practices can also assist you to be more effective and efficient. Practice #1: Be poised, centered and grounded. It’s a given that there should be no real conflict of interest or perceived conflict of interest between your job and your startup. In my situation, my day job was with an employer that made software and hardware products for IT infrastructure deployments, while my startup was in the social media space. Talk with friends, family and advisors to be assured that there is no conflict of interest between the two enterprises. Otherwise you will likely be violating your employment contract and be subject to legal action, and obviously putting your reputation of integrity, honesty and character at risk. Also, do not run your startup during the time in the day that you are supposed to be working for your employer, and in your startup do not use any resources whatsoever that are provided by them. Use common sense to extend these rules of integrity to businesses that are associated with your employer, such vendors, partners, customers, etc. Once you are clear that there is no conflict of interest, then the skills for time management and separation of roles become your primary concern. Lots of people have two jobs; however, it is especially difficult when the people you interact with for both your regular job and your startup have expectations of your availability during the same hours of the day. Providing clear rules to yourself, consistently following them and explaining the self-imposed guidelines to those individuals involved with your startup will simplify your communications, work efforts and avoid any atmosphere of impropriety. This in itself will clarify your thinking, help sort out key tasks and actions, and free your mind from unnecessary complications. Practice #2: Avoid conflicts of interest—they are a hindrance, costly and destabilizing. Time management is about efficiency and effectiveness. Efficiency ensures completing actions or tasks quickly and with minimal resources. Effectiveness is about selecting the most powerful actions or tasks to perform—those that produce the outcomes you want. 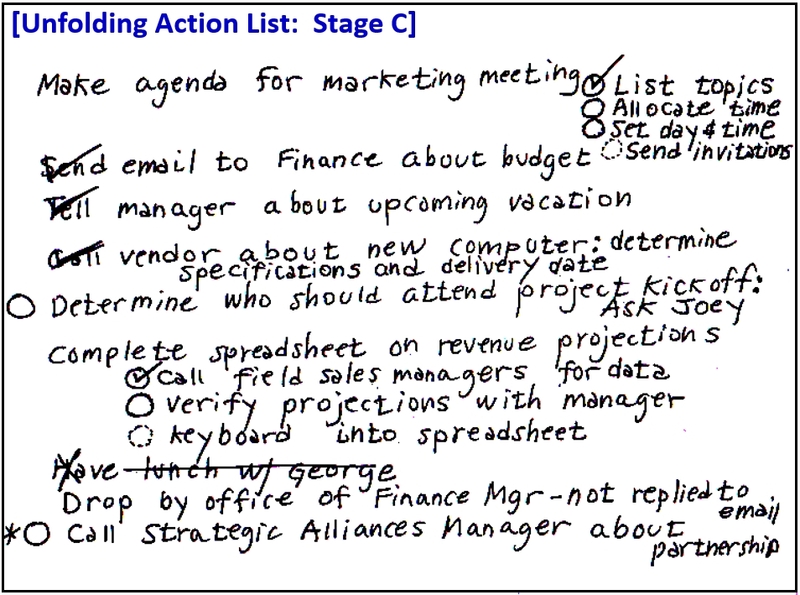 The “Unfolding Action List”– described later– is my method of time management to produce efficiency and effectiveness. Efficiency is more observable, mechanical and naturally achieved than effectiveness. It comes with time, experimentation and training. Effectiveness is more complex, subtle, and involves greater personal interaction, social and political awareness, reflection, emotional intelligence and judgment. Effectiveness is choosing which actions or tasks to tackle—managing and completing those that are the most impactful and not doing those that are not important and not valued by others. Effective actions always have a customer—an individual or actor that appreciates the effort and result. Generally, the action is for someone else—a boss, manager, coworker, partner, customer, etc. However, it can be for yourself. To be effective, you should perform actions that produce results that generate outcomes to your advantage—directly or indirectly, near term or long term. At work, taking care of your manager’s concerns comprises the most important actions. Doing things for the “good of the company” without identifying a specific customer is a waste of time and effort. Know who the customer is—who will be appreciative, pleased or grateful—and how they will eventually reciprocate for your productive effort. If you can’t identify the customer and what you expect in return, then aren’t you being inefficient and ineffective? Always have anticipated results and reciprocity in mind when designing your action plans—what are the planned outcomes and what will be the outcomes and rewards from your efforts? Think through the future benefits you will accrue and the return you will receive on your invested time and expertise. If an action doesn’t produce a benefit back to you, then you are doing it for yourself. I call that karma, which to me means that you are doing something altruistic for the good of others: for your own integrity, compassion, caring of others or love. For the success of both your paid employment and your startup you will need to have others and yourself assessing that your outcomes are effective, productive, noteworthy and, most importantly, valued. I was fortunate to have a group of individuals help me launch my startup. Those who were active participants changed over time. From them I always received valuable feedback, ideas, challenging questions, suggestions and assistance of various sorts. The last thing you want to be is a lone ranger, acting by yourself without having your key ideas, plans and actions examined and evaluated for sensibility and viability. Build your own real or virtual team and have ongoing conversations with them individually or as a group to get new ideas, refine your assessments, set objectives and design effective action plans. Your co-founders, team or mastermind group can be compensated by providing mutual assistance—providing similar feedback to each other, or bartering or trading time and expertise through exchanging help based on different technical and business-related skill sets. Honesty, reliability, sincerity and competence in the domain for which you promise to provide results is the cornerstone of building and maintaining trust. Your character, dignity and reputation depend on trust. Always be trustworthy: reliable, sincere, forthright, open and competent to fulfill promises and commitments—as promised and on-time. This builds your social capital which is essential for cooperation, coordination and collaboration—leading to business success. Wise investment of your time produces social capital, which generates money-producing business value. In turn, prudent spending of your hard-earned money leverages your time to be ever more efficient and effective, which amplifies the assessments by others of your capabilities and trustworthiness. Keep in mind the recurring fortuitous cycle for producing trust, social capital, valuable offers and investment in time-saving services, tools and assets. As Sean Murphy says, time is your true scarce resource followed by social capital. Practice #3: Create time through effectiveness, executing committed actions, building trust and teaming. Because your employer pays you for your time and accomplishments, and provides workspace and material resources to facilitate your productivity time on the job, the resources provided need to be used for the intended purpose. Misuse is unethical and can be a cause for termination. However, your dual roles of paid worker and entrepreneur can be performed in parallel. When you are doing your paid work you’re your employer’s concerns and your efforts to take care of them are topmost—in the foreground of your thinking, while your startup’s concerns rest in the background. When it is time to pay attention to your start up, your entrepreneurial interests become the foreground of your thinking and your job responsibilities fade to the background. The focus of your conscious mind is the foreground of your thoughts, and while the background becomes part of the unconscious mind, nascent and unresolved ideas and motivations are sorted and developed to appear later—what I consider new creative ideas or problem-solving thoughts or “percolating” to the conscious mind. For legal, ethical and practical reasons you will want to separate materials, devices and equipment for your startup versus your regular work. Making this a standard practice will facilitate peace of mind and sense of integrity as you perform your parallel actions. Employer provided materials, devices and equipment are to be used to facilitate your job performance and not your startup. For example, mobile phones, computers, copiers, stationary, Internet access and so forth provided by those that pay you for your work should be used only for their intended purpose. Therefore, don’t use Facebook, LinkedIn, Google, etc. for non-employment purposes at your day job. Think of the saying “Never dip your pen in the company’s inkwell.” Instead, purchase or find the resources you need elsewhere. At one time I carried a Blackberry provided by my employer for work email and an iPhone for my personal and startup email, kept a notepad and briefcase in my car exclusively for my startup, which allowed me to catch-up on startup emails at lunch and during other personal time. If you are efficient, effective and productive in your regular work, then you can be at ease for turning-out results for your own business. The workday belongs to your employer, or if you are a contract employee then to the employment agency and the company for which you are generating results. That the workday belongs to your employer is true in a factual, legal sense and needs to be the assessment of those that engage your services for the sake of your livelihood. Your employer’s assessment is based on the results you bring and their perception of your work habits and other behavior. So, your first order of business is to look like you are working effectively, and to actually produce outcomes that satisfy your employer, your boss and your coworkers. Then, as a second order problem to solve, you can devise legal, ethical and practical ways to produce results for your startup. My startup attorney said that the workday, say from 8 AM to 5 PM or whatever, for best practices, belonged to the employer. This was during the Internet boom when people did not so much blend their work life and their personal life, taking personal calls at work and work calls at home in the evening as we do now. At that time, without discussing the matter, and figuring that that was the attorney’s opinion, I interpreted that the lunch hour belonged to me. So, I typically left the work premises during lunch to work on my startup, and followed up on emails, phoned people and/or left voicemail messages, edited presentation slide decks, read articles or wrote materials. By driving just a few minutes away at lunchtime I was able to produce almost full hour of work effort for my startup nearly every day. I found quiet lunch places with wi-fi, park picnic tables and other places where I could go online, read and write, think about my business and discretely make calls on my mobile phone. After some time I found my favorite place. It was a hotel lobby with free wi-fi, tables and chairs and an outdoor area. It had restrooms, drinking water and I was so much a regular they sometimes brought coffee or snacks to me. I was friendly and said that I would recommend the hotel to those I worked with, so they figured my using their facility was an asset to their business. At one point during my use of the hotel lobby some people started to regularly park outside to use the free wi-fi, so the hotel management blocked that activity with a password, which they gladly gave to me because I was a regular visitor. While my particular situations will not be yours, always be on the lookout to find resources or environments that can enhance your efficiency and effectiveness. My employer had flexible work hours, so it was fine with them if I occasionally came to work late and stayed late, or came in early one day and left early. Of course I managed my calendar so that I attended the meetings I was invited to attend, and I regularly produced satisfactory outcomes for my employer, so there was no issue with this practice. With this flexible schedule I was able to have weekly meetings with my startup staff. Further, with deft time management skills and appropriate planning I was able to schedule longer breaks during the day, as my employer knew that on some occasions I had a “personal appointment”—but there was no concern by others because I was attentive to my duties and produced the outcomes expected by coworkers and my management. By this means I found time to have some longer startup meetings, such as having periodic staff meetings during a carefully timed extended lunchtime, typically at the attorney’s conference room provided at no charge. During one phase, a key advisor and I held meetings at various times of the workday with 11 venture capitalists over a four-month period. Meetings with what became our pilot customers were also scheduled in a similar manner. Your specific experience will be different, perhaps more restrictive or maybe with additional flexibility. Be creative with your time management designs and practices, just as you must be with the innovations you are creating for the customers of your startup. Practice #4: Separate role performances and resource uses between regular work and your startup efforts. Enhancing your capabilities for producing the outcomes you seek is the purpose of this discourse around productivity, effectiveness, designing courses of action and interpretation of phenomena and observation into thoughts, models, paradigms, knowledge, assessments, understanding and purposeful behavior. Recurrently producing actions to take care of a want constitutes holding a concern. We all have many wants, many of which are superficial. Those that are deep and for which we recurrently attend to with planning, designs, decisions and productive action are truly concerns for which we are taking care. Consider all the concerns that might be important to you, ranging from health, career success, family, friends, spirituality or transcendence, financial success and so forth and list them. Reflect on them, consider what the criteria of success are for what you aspire to accomplish and then design effective and efficient actions to produce the outcomes you seek. Next, consider your capabilities and capacities—and the periodic need for rest, reflection and recreation—to design the actions that will fulfill your goals. Find a tempo or rhythm that works for your productivity. When you have decided to take significant actions to produce outcomes for the sake of your concerns, expand your cognitive thinking with new ideas, memes, viewpoints, models, assessments and interpretations to expand your abilities, skills, understandings and performance. Over the years I’ve accumulated a lot of self-guidance memes or ideas that have allowed me to make decisions, big and small with regard to my work-life and relationships with others. You, too, may have quotations, aphorisms or morals-of-the-story that succinctly capture lessons learned. A lot of the Aesop’s Fables come to mind, for which the judgment of choosing what decision to make to be most effective often pivots on interpretation of the situation and experience with similar circumstances. Some memes, sayings, quotations and guidance recommend opposite courses of action, and any good rule of thumb has conditions for which a reversal of the rule is the most effective. Strive to be shrewd, while being trustworthy—this is the path for building character, reputation and wisdom. The “squeaky wheel gets the grease” and “the quacking duck gets shot” are opposing aphorisms; moreover, they are opposites. You can do one or the other, but supposedly not both. When I have an urge or thought to speak-up or shut-up I seek counsel from these sayings. Seek the time to reflect and then use your best judgment. If it is a question of morality and the situation is urgent go with what is right, and avoid a choice that you would later regret. “Heads up” connotes paying attention to surroundings and the environment—socially, politically and with your senses. “Keeping your nose to the grindstone” indicates that one should pay close attention to the immediate task at hand and not be distracted by other thoughts or surrounding events. I believe that both can be done at the same time. When you are focused and concentrating on a particular task or action, you can generally remain aware of your surroundings, paying attention to subtle changes that might indicate a condition or event of possible impact or importance. I assess that this is a skill that is developed over time and practice to moderate and tune what is in the foreground of your thinking. Almost all projects, programs, continuing series, businesses and life itself, go through changes, shifts, transitions or phases—a cycle from beginning to end. If we defined four phases they might be initiation, ramp-up, maturity and closure; or beginning, growth, harvesting and ending. In terms of personal energy and enthusiasm one author says they are awakening, increasing, containing and completing. We all have a tendency in the projects and actions that we take to perhaps favor one part of the cycle more than another, dwelling more on that phase than another. Or, perhaps there is a segment that we are weak on—we’ve all heard about someone that is three units short of their college degree, and somehow cannot complete the small last step for their significant effort to be completed. Try to assess which parts of the overall planning and action steps that you favor or tend to neglect—and to what degree this preference or behavioral trait impacts your effectiveness. If you are a person that gets stuck and cannot effectively draw projects or plans to their completion, or a person that starts a lot of projects but habitually does not take promising endeavors to their completion, find a way to change your behaviors. The key for being effective is the ability to turn out results that have value. To perform this recurrently and with the volume that has significant impact you also need to be efficient, keeping an eye and pushing to achieve your goals and target outcomes. Results matter; however, take time to appreciate the path: observe others and yourself; learn from your experiences; assess and enjoy your growing skills, capabilities and capacity; make friends and take care of your health. Don’t aim too low. Don’t embody the proverb of the man that while walking continually looked down for a dropped quarter on the ground rather than appreciating the views and living things around him. Look for the big things in life, don’t continually scrape for small winnings. But, don’t always shoot for the moon—be imaginative and practical. Use every moment for some purpose, whether it is heads-down for your startup or paid work, or for what Sean Murphy calls lateral thinking—this is exploring possibilities, being open to new thoughts or “weak signals” that might allow early detection of something of significance. On occasion, a little “purposeful drift” might allow creative thoughts to surface. Be balanced in thinking about the here and now versus what’s visible at the horizon or what might be beyond your view. Take care of the “here and now”—those individuals and necessary actions in your presence. Then, when the “here and now” are taken care of explore your expansive thoughts and aspirations of what you want to accomplish, and start to design abilities, skills, resources, plans and strategies to make them real concerns for which you can nurture and start to take care. Moving your thinking between concerns for which care is urgent at this moment and concerns for the future is a learned capability—take the time to learn how to move your attention between immediate and visionary concerns. However, occasionally reward your psyche by acknowledging and feeling gratitude for your friendships, accomplishments, abilities, opportunities and other positive aspects of your attention. To be thoughtful, be aware of your thinking for ideas for success, taking care of concerns and gratitude. Periodically, check your mood for positive, can-do thinking—motivation to achieve your chosen goals is the foundation of productivity. Negative thoughts constitute waste—ignore them and move on when they occur. Seek to be balanced between mindfulness of the current moment—holding awareness of what is physically around you and the resting state of your mind—and reflecting on the past and aspiring future accomplishments. Periodically, have wonder about all that is around you, reverie for past accomplishments and speculations for what might be. Then, come back to your present and perform the actions you have designed and for which you hold commitment. In the present, be in action to accomplish your ambitions. We each have many more wants than we can fulfill. Ambition is choosing effective action to fulfill specific and meaningful wants. For many continuums there is a cusp, tipping point or shift. Another aspect of this is the interpretation that a “sufficient difference of degree is a difference in kind.” Nature and other universes of possibility provide examples. Consider precipitation in its forms: there is a difference of quantity and temperature: fog, mist, drizzle, showers, rain, thunder storms, snow and so forth. They are all a form of water in the air of different degrees of temperature and amounts, but they are sufficiently different in their form to represent different kinds of weather. Further, the effects of degree of weather can be significantly different in kind for the seriousness of traffic accidents, river overflows and so forth. 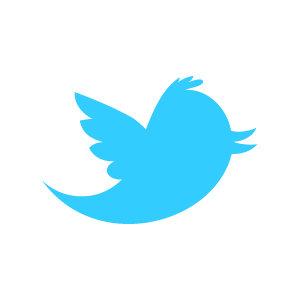 There are innumerable examples in almost any domain of interest. When you are seeking to better understand a person, thing, idea or situation, consider how it is both a difference in degree and a difference in kind from what you believe is similar, comparative, different or unique. Supposing that you have identified your concerns and have some ideas on how to take care of them, you will want to design actions to produce the outcomes for which you will strive. Given that you have finite, limited capabilities and capacity at any moment or time period, you will need to choose which to fulfill, and in some cases you might find that not all of your aspirations can be performed. However, by means of actively choosing which actions to take on behalf of your concerns, you will maximize your progress and satisfaction with your own performance. Remember that not all of your concerns revolve around your paid work and startup: there are other more important concerns in life including family, friends, health, financial stability and so forth. Real success requires taking care of all your concerns. Carefully make assessments about when an action is complete. Conrad Hilton in his autobiography said something to the effect: “Have done all, stand” for which I remember he referenced the Bible. In his story, he had a pending business deal, made an offer, then went on vacation without being available for further discussions or negotiation. In this situation, he had done all that was possible, and it was up to the other party to take the next step for any possible action. It was better to “leave well enough, alone” than to unnecessarily tamper with what was sufficient and satisfactory. Attend to your concerns on a daily basis. My motto is to take care of all your concerns as best as you can—be diligent but not stressed in your work to be efficient, effective and productive. At the close of each day, for a good night’s sleep I remember what Walt Disney said: “Why worry? If you’ve done the very best you can, worrying won’t make it any better.” Then, I start the next day, anew. Practice #5: Engage creative thinking for innovation, effectiveness and fulfillment. I look at it and update the Unfolding List several times a day with marks for actions completed and entries for new actions. As the day goes on I checkoff items as completed, add new items and reprioritize listed actions. Sometimes I split a big action into multiple components to ease my starting on its fulfillment or avoid a sense that I might be procrastinating—then I get going on the first, perhaps small, step. I update the list with minimal effort and markings, thereby being efficient and effective in this time and goal management practice. Actions are performed for taking care of concerns and in the back of my mind I know who the customer is—who’s request of need is being satisfied by my effort. Procrastination and wasted effort are squeezed out of my day. The purpose of the Unfolding Action List is to maintain a steady level of activity and performance with a sense of order for what should be done next or soon, and to allow reordering of urgency and importance without a time-consuming rewriting effort. The Unfolding Action List for your work includes all the actions known for the near term that are needed to take care of your concerns in that domain—you can have one for your employment and one for your startup. Personally, I manage the List on a 8 ½” X 11” piece of paper folded in half—it’s about the right size, looks different from other papers on my desk, and since a pen is always handy I’ve found it easier to make changes than using a Word file or app. If you don’t want to use the paper process I describe here, you might still find some useful ideas. If you find something useful in the processes I describe for creating and updating the list, then adapt it for your use; otherwise, invent your own methods to fill any gaps for sorting, reordering and prioritizing your planned actions. Note that the concept of prioritization is different from importance—prioritization simply means performing some actions before others. The overall personal commitment you hold is to take care of all your concerns. Therefore, unless there is a change in your strategy for taking care of your concerns or there is a change in requirements from others, as customers of your performance, all the actions need to be completed—regardless of their ordered priority at any moment in time. You are a busy person, so only list important action items. If it is unimportant, don’t do it. See the image below that shows the Unfolding Action List in four phases, Unfolding Action List at stage A, Unfolding Action List at stage B, Unfolding Action List at stage C and Unfolding Action List at stage D.
For readability of the small format in the image below I’ve shown the sample List in a horizontal shape, while my real List on a 8 ½” X 11” piece of paper folded in half is oriented vertically and has in practice about double the number of action items shown in this example. 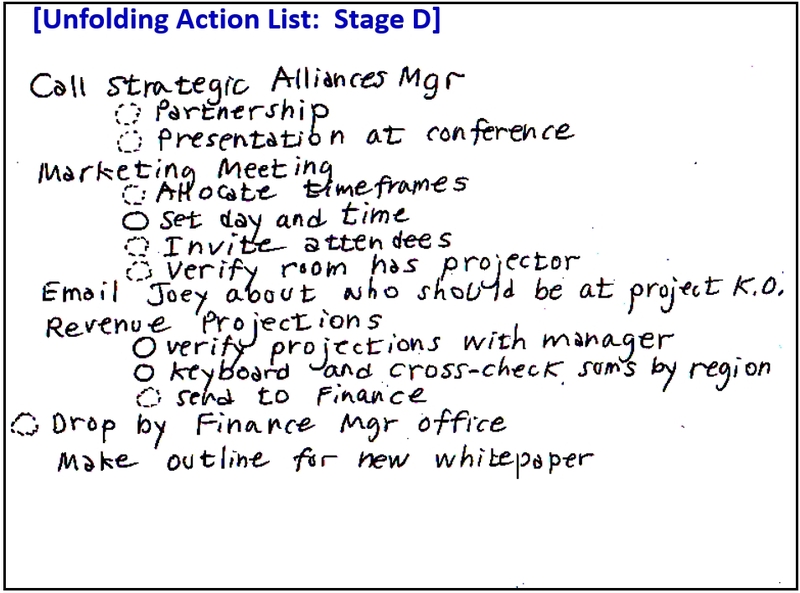 The Unfolding Action List at stage A is the first iteration, and it has the items that are important to complete. Note that this exposition is representative rather than definitive—I tend to have more items on the list than what is shown to convey the concepts to you. 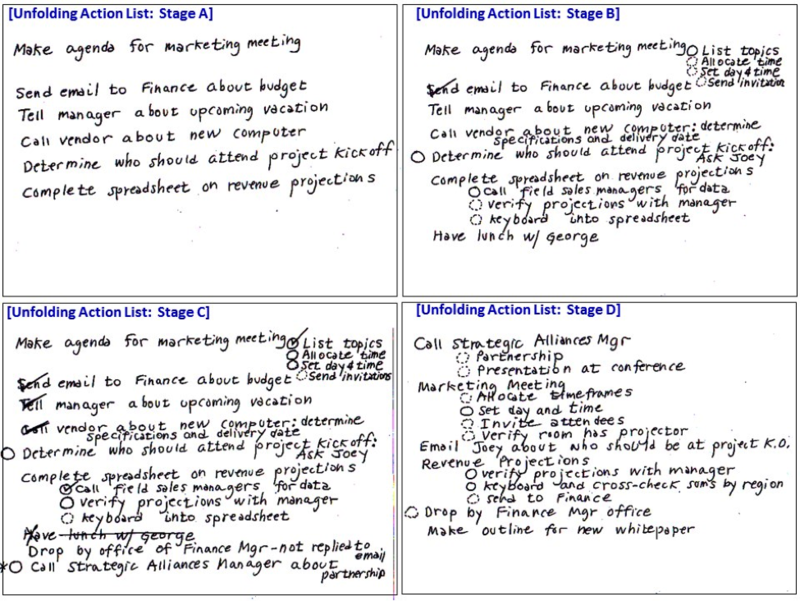 After some time, perhaps hours or days later, the list might look like Unfolding Action List at stage B, then after a similar period like Unfolding Action List at stage C. When the list gets a bit messy then I rewrite it to look like Unfolding Action List at stage D—when it’s more efficient and effective to rewrite it rather than manage it when it gets messy. Then the cycle of updating and eventual rewriting continues on an ongoing basis. When rewriting the Unfolding Action List, you can bring to the forefront your thinking and reflections of what is important, perhaps adding new items that have been in your background thinking. As you rewrite the List omitting the items already completed you might choose to reflect on your work efforts, and reward yourself with some reverie or self-congratulations for your accomplishments. Perhaps you will take some moments for thoughts of gratitude. As you repeat the cycle you will recursively gain experience and capability for performing actions and achieving your objectives evermore powerfully. 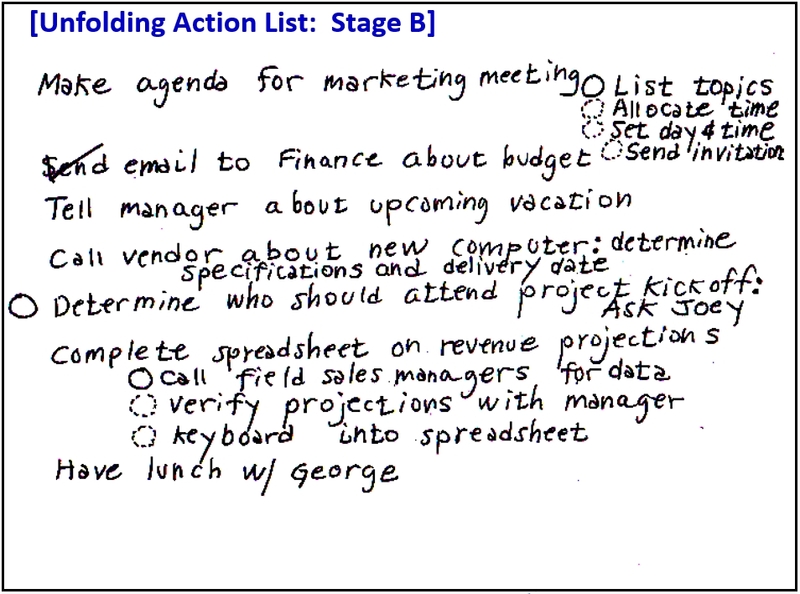 Remember to adopt the Unfolding Action List concepts to your insights for effective action to take care of your concerns, and your behavior can become much more powerful than a simple to-do list. For your employment work your Unfolding Action List will identify actions exclusively for performing that work effort—that is your domain of performance that should be foremost in your thinking. Let’s look at the sample four phases. See the graphic figure that has four panels. You can, and should, update the Unfolding action list at any time. The four panels represent snapshots taken at arbitrary moments as the List unfolds through time. In this panel six actions are listed. Each has a meaning and understanding beyond what the short description says. These are the thoughts that came immediately to mind about what is important to do. It does not have to be complete, ordered, and fully-descriptive or necessarily avoid inconsistencies among the list of actions. It’s imperfect and will, through successive iterations, be modified to plan and navigate the identified actions for the sake of taking care of our concerns. In the panel showing Stage B you can see the check-mark for “Send email to Finance about budget” was completed, and that four component actions have been identified. The action “List topics” has a circle to the left indicating that the item is a priority item—the first of the four things to do. The dashed-circles are items of a lower priority than those with a solid-circle. Another change is that “Determine who should attend project kickoff” now has a solid-circle indicating that it should be done soon, and text has been added—“ask Joey”—adding specificity. More subsidiary components for the action “Complete spreadsheet on revenue projections” have been added, and a new action, “Have lunch w/ George” has been added. Note that normal priority items have no circle, heightened priority items have a dashed circle, even-higher priority actions have a solid circle next to them, and those with a solid circle and an asterisk are the highest priority. With this notational scheme it is easy to up-level the priority of an action item without erasing or crossing-out any text or marks. 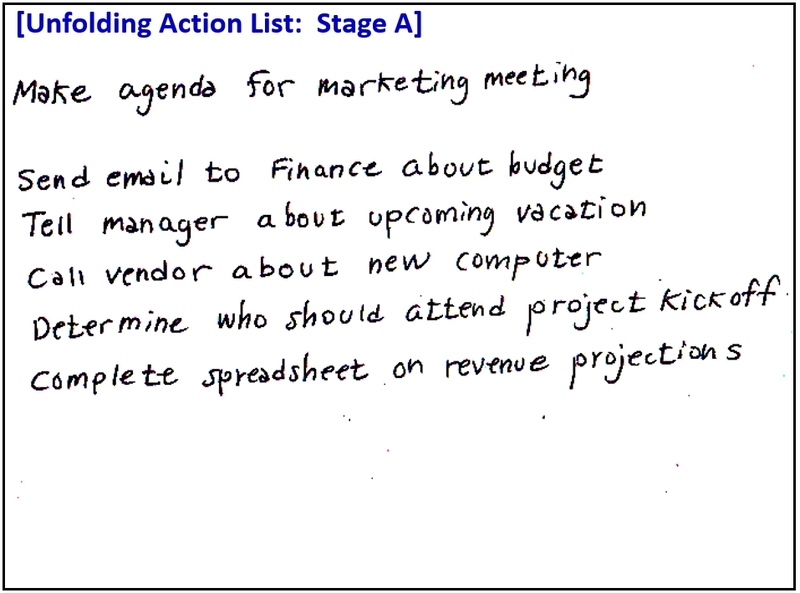 Between the time of the snapshot taken of the List at Stage B and Stage C, the priorities of “Allocate time to topics” and “Set day & time” as components of “Make agenda for marketing meeting” and “Verify projections w/ manager” has been boosted with the added notation of the solid circles next to them. Note that “Have lunch w/ George” has been x’ed-out as it was decided that it didn’t need to be done. “Drop by office of Finance manager—not replied to email” is a new item on the List, as well as “Call Strategic Alliances manager about partnership”—note that the latter has a solid circle indicating that it has priority and an asterisk indicating a very high priority. As the list becomes overwritten with marks and new items it becomes messy—then the solid circles and asterisks are used to catch my attention for what should be done next or soon. In this example panel I’ve rewritten the List with my new understandings of what is important and urgent. The more important or urgent items tend to be written toward the top of the list. I readjust and reduce the extent to which the asterisks and solid circles are used, so that as this newly rewritten version progresses through time I will have the ability to signify the boost of priority of some items by making dashed circles into solid circles and adding asterisks. During the time of rewriting, which might take five or 10 minutes, I take a little extra time to reflect on my accomplishments—what has been completed, which customers of my efforts have been satisfied and what concerns I have taken care of. When the List is done I take a moment for pleasantly musing in the moment and hold thoughts of gratitude for my situation and circumstances. Then, my mind is off to produce more results with the clearly defined and prioritized action list to guide me until the workday is completed. Practice #6: Adapt the Unfolding Action List to fulfill your goals and aspirations. Remember, that this is more than a plug-and-go technique; rather, this is a practice for which, as experience is gained, new procedures, processes and variations can be coordinated. You will want to have a separate Unfolding Action List for your startup and a separate Action List for your work—you certainly don’t want people at work to see that you have a list of actions for your startup, as they probably don’t need to know that you have such a commitment. Occasionally, you might want to write a Action List just for the day, or a tactical brief Action List for the morning’s urgent work to be completed before going back to the comprehensive Action List. Experiment and design your own variations—each person’s ability to be efficient and effective is unique and embodied through your ongoing practice. By periodically looking at the List you can maintain a continual flow of awareness, attention and action on behalf of your objectives, goals and concerns. By managing my Unfolding Action List I am never at a loss for what to do—there is always something important, and perhaps something urgent or impending. Furthermore the most important are flagged, and if an action item seems so big as to be intimidating or to be procrastinated, I simply break the beginning into bite-sized chunks that are easy to start—for example, you can make the first draft of a report outline or a list of topics for discussion in 10 minutes, then enhance it in subsequent sessions. With this 10-minute effort you have obliterated the Bogyman of Procrastination!!! Make a list of your concerns for work, your startup, friendships, marriage, family, health and what other ongoing concerns are important to you. Then, design actions to take care of each. Identify important and difficult decisions and use the Benjamin Franklin method—search on the Internet for “Benjamin Franklin Decision” for (A) his method of listing the motives and concerns and (B) the notion that the process occurs over “three or four days’ consideration”—a duration for what I believe allows the unconscious mind to assist in the evaluation of the relevant merits and importance of the listed motives and concerns. You are now on a mission for goal achievements. Design actions to produce outcomes to take care of your concerns. Avoid time sinks that distract or divert you form your goals, purpose and objectives. 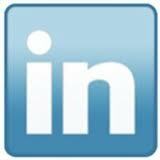 Cut the time spent on social media like Facebook, LinkedIn, Twitter, etc. Sever yourself from the allure of television and videos; bypass most of the news from papers and magazines which is mostly repetitive and not insightful—and borders on common knowledge. In short, avoid shallow and other memorizing media as it is a diversion from the real, embodied world where actions occur. All these ideas are presented for your ready use, testing and experimentation for the sake of producing actions to take care of your concerns and enjoy “living the good life”!!! “Hard Drive” presented material on “Part D: Separation of Resources and Roles to Avoid Conflicts” and “Part F: The Unfolding Action List” at the Fri-Sep-2-2016 Bootstrapper Breakfast in Palo Alto. How long did it take him to do it? Was it a month, a year? How long before he shut down? He is detailing his lessons learned from several years of effort.